STAUNTON, VA—The American Shakespeare Center (ASC) will host community events, expand pay-what-you-will performance offerings, and sponsor a coat drive benefiting Valley Mission throughout its annual Holiday Season. The Holiday Season features performances of its beloved tradition A Christmas Carol (in its eighteenth year at the Blackfriars Playhouse) and, back by popular demand, the hilarious Every Christmas Story Ever Told (And Then Some!). The Holiday Season kicks off with a free community event at the Blackfriars Playhouse on December 3 at 7:30. The event features performances from Robert E. Lee High School (a double murder mystery), Stuart Hall (an original devised UK-style holiday pantomime), and ASC’s drama club (three scenes from The Winter’s Tale). Through December 17, ASC will collect warm clothing, non-perishables, and cleaning supplies for Valley Mission. “We are incredibly grateful for the support from our friends at the American Shakespeare Center in helping us provide warm clothing, food, and supplies for those who are experiencing challenges this holiday season,” says Valley Mission director of development Greg Beam. “Without both in-kind and financial gifts from individuals, local businesses and civic groups, Valley Mission could not exist. Together we are making a difference in the lives of the homeless, right here, right now.” Collection bins will be placed throughout the lobby prior to each performance. Items will be hand delivered by a Christmas Carol cast member. A Christmas Carol returns for its eighteenth annual production with a new script adapted by ASC’s associate artistic director Jay McClure. Charles Dickens began the Carol Christmas tradition in 1849 when he routinely performed his own version of the story. The new ASC script adheres to Dicken’s telling, producing the classic, fun, and heartwarming story of reflection and redemption on the Blackfriars stage. 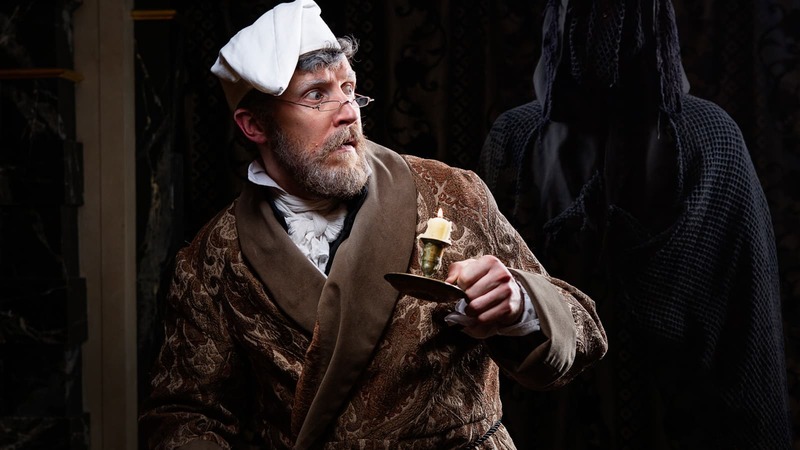 ASC veteran Patrick Earl stars as Scrooge alongside the company of the Hand of Time Tour. Performances begin December 5. Pay-what-you-will performances are December 5, 6, 7, and 11. Families looking for something different will enjoy Every Christmas Story Ever Told (And Then Some!) back by popular demand this year after last season’s smash engagement. What better way to ring in the holidays than with every Christmas story ever? This fast-paced romp takes audiences on the Christmas journey of a lifetime, through your all of favorite holiday classics like Rudolph, How the Grinch Stole Christmas, A Christmas Carol, Frosty the Snowman, and more. ASC veterans Chris Johnston, Benjamin Reed, and Meg Rodgers play more than 30 characters in Every Christmas Story starting December 4. Pay-what-you-will performances are December 4, 8, and 9. Best seats start at $57 and can be purchased online at AmericanShakespeareCenter.com or by calling the box office at 1.877.MUCH.ADO. Additional pay-what-you-will performances are available to the Pay What You Will Club. Student, Senior, Military, and AAA discounts are available. Groups of 10 or more who order together save 20%.